It's not actually a celebrity sighting if you intentionally go to an event where the celebrity is scheduled to be at. So I went to the Googleplex for the first time on Tuesday to visit my "acquaintances" Carol, Lisa & Coach Ed. 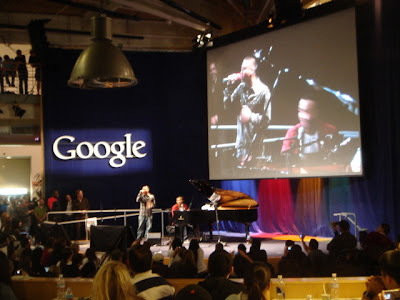 I was invited to Google's private concert featuring John Legend. First of all, I was impressed with Google and their facility - free food, drinks, etc. The vibe there was energetic with mostly 20-somethings in the room. Most of them were there for a few hours with their laptops as they were doing their Google work while waiting for the concert to begin. My "acquaintances" were camped out in their auditorium about 100 feet away from the stage (think Row 10 at Shoreline) so we were really close up. John Legend played an hour set with 2 breaks. He played several of his hits like Save Room, P.D.A. & Ordinary People. The breaks included a Q&A with the employees where they could ask him anything like, "How did you break into the business?" (BTW: it took him 6 years to get a recording contract after he was doing management consulting), "What do you like to do in your spare time?" (surf the web with Google), and "Can I sing Ordinary People with you?" (the Filipino guy that sang with him was pretty good). Thanks to Carol for inviting me! I edited this post and changed "friends" with "acquaintances" per the BigAlsHouse.com's policy that Males & Females cannot be "friends". There's way too much sexual tension involved. However, because males cannot have sexual tension with other males they can be "friends". that update was lame and LAME!!!! you just dissed my life style yo! i guess u're just not mature enough to be able to be friends with a female. don't worry tho, we will still be BFF 4 life! !